While cloning virtualized domain controllers is nothing new in Windows Server, Server 2012 does deliver improvements that make cloning DCs easier. There are a number of benefits to DC cloning. First, it’s an ideal way to scale up a growing Windows infrastructure, because you can quickly deploy DCs without investing in additional hardware. It also saves IT time, because there’s no need to reconfigure a DC. Also, the ability to clone a DC is a good strategic part of a disaster recovery plan. There are some checks and preparations to make before you can clone a virtual DC. For instance, you have to authorize a DC for cloning. You do so by adding the DC to the Cloneable Domain Controllers group in Active Directory. This is a group under the Users container in AD. System administrators also have to make sure that the DC serving the FSMO (flexible single master operation) role as PDC (primary domain controller) emulator is running Windows Server 2012. In addition, you must check to make sure that any applications running on the DC can be cloned. This cmdlet runs on the DC to be cloned. The command checks against a list of common apps that can be cloned in a virtual setting. The output of the file displays apps that have not been verified as safe to clone for either licensing or functionality reasons. If you run the file and an app you have installed on a DC appears on the output list, you can contact the app’s vendor and ask if it is safe to clone, or you can remove the app from the DC and reinstall after cloning. You then need to run another cmdlet. Run New-ADDCloneConfigFile on the virtual DC to be cloned. This cmdlet creates a configuration file for the clone process. The command has to be typed with specific parameters, including the DC’s computer name, IP address, DNS address, gateway, subnet mask, WINS Server IP address, and domain name. "192.168.1.10" -Ipv4SubnetMask "255.255.255.0" –CloneComputerName "VMDC1"
The VM getting cloned is then shut down. Right-click the VM in Hyper-V Manager and select Export and you’ll be prompted to save the exported VM. 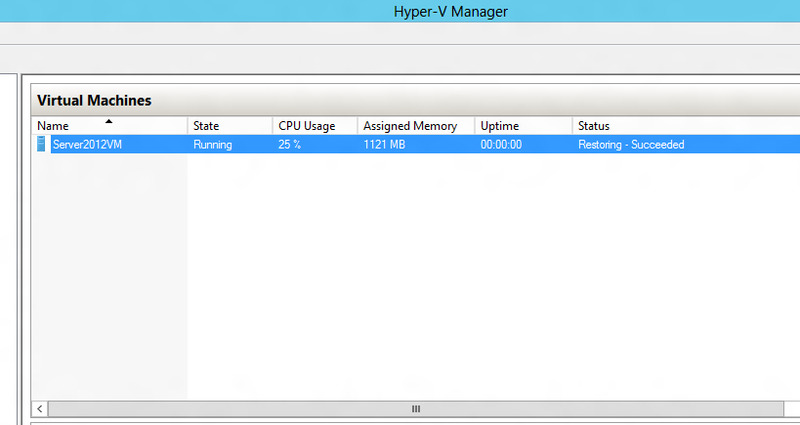 Click Export, and Hyper-V Manager will display the status of the export. A subfolder gets created in the directory to which the exported VM is saved. The subfolder is created with the same name as the exported VM. In the subfolder are three more folders: Snapshots, Virtual Hard Disks, and Virtual Machines. 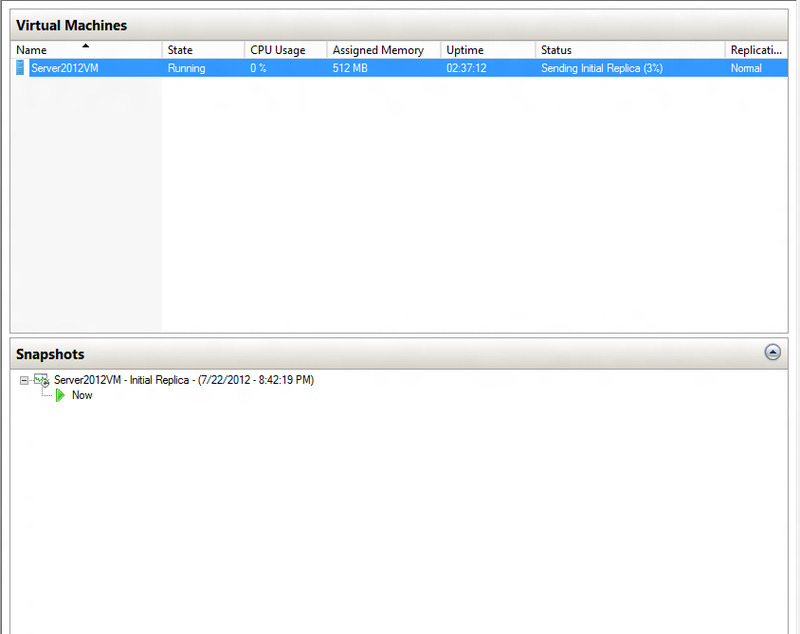 These are all the associated data elements that get exported with the VM. 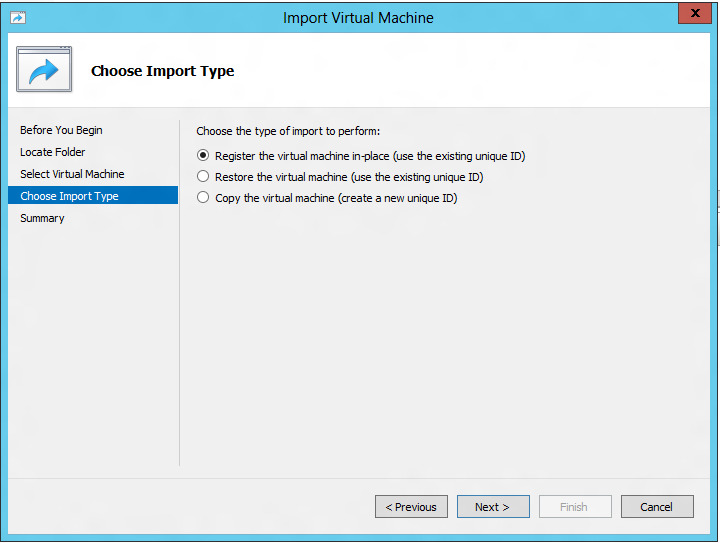 This is a new option in Hyper-V R3 for the import process. This option uses the existing unique ID. If the VM you are importing already has its associated data files where you want them and all you want to do is fire up the VM in Hyper-V, then go with this option. If the VM’s files are saved on a network folder or external disk, Hyper-V will move the VM’s files to the appropriate location and then register the VM. If you want to import the VM more than once, this is the option to choose because the VM is given a unique ID. Snapshots are data files used to restore a VM to a past state. These files are mostly used in testing environments, but they come in handy if you’ve made a change to a VM that caused a problem with it, such as applying an update, and now you want to revert the VM to its state before the update. Snapshots, of course, are not a new feature in Server 2012. What is new is that a snapshot can now be merged into a VM without shutting down that VM. This is a major change in technology from Hyper-V on Server 2008 R2, which required the VM be powered off to merge snapshots. To revert a running VM to a previous state, from the Actions menu in the Hyper-V Manager, right-click the VM and select Revert. The Revert Virtual Machine dialog box appears, confirming the revert selection. In Figure 8 you can see the reversion process happening while the VM runs.